Most people do not realize just how much of an impact paint can make in a room. Even though the color on the walls is just a background, it can literally transform the size of the room from an outside perspective. If you have a small room that you want to make look larger, a professional Minneapolis painter should be able to come up with a paint scheme to help you out. Here are some ways to use paint to make a room look bigger. Light colors can make a room feel bigger than it is, especially if you have a lot of sunlight coming into the space. The light will reflect off the walls and truly illuminate the room. By comparison, dark colors can make a room feel smaller, especially in rooms with minimal light. 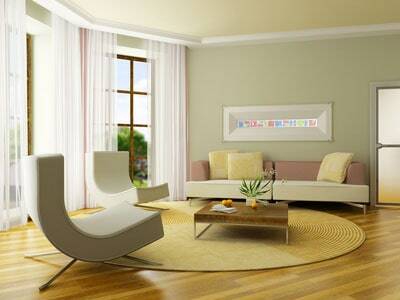 Try to use an off-white or beige hue on your walls, and you should see a huge improvement in the apparent size. When used in moderation, stripes can help emphasize the height or width of a room. Vertical stripes can make a room look taller, and horizontal stripes can make a room look wider. If you use a few thick stripes, you will get a much bigger impact than you would with a series of small, compact stripes. Whether you use wallpaper to do this or you have professional painters in Atlanta do the work for you, you will end up with a much larger room than what you currently have. White furniture and cabinetry make a space feel open, which naturally makes it look bigger. If you have dark furniture, you will anchor the room and make everything feel tight. Try to add as many light accents throughout the room as you can because those will help it feel as open as possible. In addition to the tips above, try to get some really good lighting to use in your room. Keep the curtains open, and add mirrors to reflect the light. All of this will make a small room look much bigger than it actually is, and that may help you enjoy your home a little more. Test out the suggestions above, and you will soon have a comfortable space to call your own.